Are you looking to improve your health and overall quality of life without breaking the bank? Then the F-1222 is the perfect swim spa for you! With a powerful 6.0 BHP Swim Jet Pump with 2.5″ Plumbing and Hi Flow Main Drains, the F-1222 offers a complete at-home aquatic gym at a budget-friendly price. Join the Cal Spas Ultimate Fitness™ Revolution with the F1222 today and feel the difference in your everyday life! Cal Spas, Ultimate Fitness™ F-1222 provides the ideal aquatic workout experience. This spa is the perfect way to achieve a complete workout without the harmful impact land-based exercises can have on muscles and joints. The new fitness spa was developed to allow users of various fitness levels the freedom to perform full body aerobic exercises, resistance training and rehabilitation in a safe controlled environment. It is proven water exercise enables the heart to work more efficiently and accounts for lower blood-pressure, joint flexibility and muscle strengthening. What is unique about the Ultimate Fitness™ F-1222 is the shallow 3’ water level which permits full range movement without losing stability due to jet pressure or water depth. 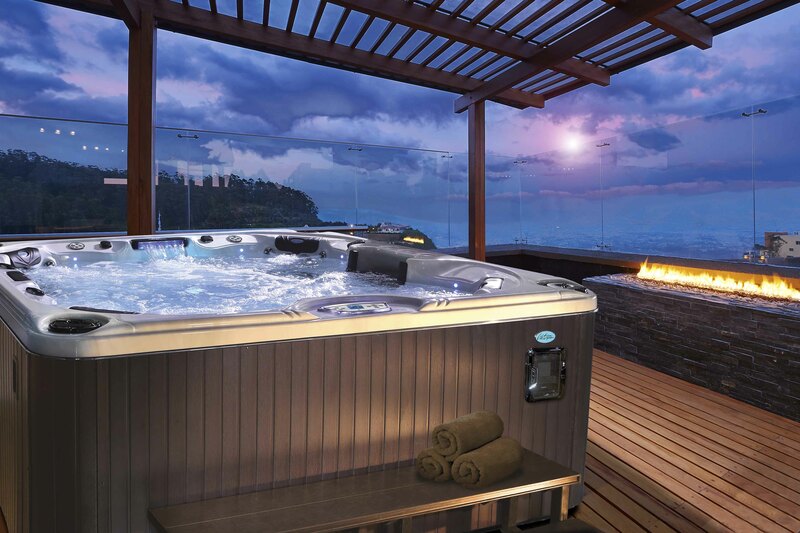 The Ultimate Fitness™ F1222 was developed by Cal Spas® engineers to provide an unsurpassed aquatic workout. The importance of living a healthy lifestyle and maintaining a fit body have become important factors in the everyday life of people of all walks of life. This spa is an easy and fun way to stay in shape and receive maximum health benefits. Some of the advantages include increased muscle strength, lung capacity and long-term flexibility. This durable fitness spa is made with a powerful 6.0 BHP Swim Jet Pump, 2.5″ Plumbing, Hi Flow Main Drains and an exclusive Bio-Clean Filter to maintain fresh clean water during your workout.